Most runners speak of a 'Runners high'-- that endorphin rush you feel when you have been involved in strenuous activity, leading to a feeling of euphoria and happiness. I patted myself on the back. And when a friend pinged to ask how is the writing going, I said 'Super, I hit a writer's high today. This is the highest number of words I have written in a single day in my entire life,'. 'Wow. Keep rocking!' he typed back. But I don't think he understood why it meant a great deal to me. Writing a book, is a lot of work really. You have to think of a story (a completely original one which noone has done before, which by itself is a mammoth task), a plot, characters (they have to be likeable, believable, and people who you can relate to) , dialogue, what happens to them. You have to write coherently. But more than anything, you have to discipline yourself to sit at the computer all by yourself and type out word after word after word. Day after day after day. I have my own ways of pushing myself. Sometimes I compete with fellow authors who are working on a book. We ping each other at the end of the day and ask 'WC?' (which stands for word count. There is great joy in typing 2300 or 3200 or whatever be the number of words one has written. A sense of satisfaction of a day well spent. 40,000-60,000 - Novelette or "Novel Lite"
'Oh, so does that mean the book will be out soon?' asked another friend. 'No! The real work starts now!' I replied. And finally it is a BIG moment when the book gets an okay and goes for printing. For my last book, upto the last moment, we were making changes. It is something like a rocket-blast off--the frantic holding of breath, till it takes off. The tension doesn't end there. When you finally hold the book in your hand (the much coveted author's copies) it is truly a moment that makes me weep. It is a lonely place, a crazy place, a place which makes you hurtle down into depth of despair when you can't get those words out, but at the same time a place which makes you soar higher than even the heavens when things go right. Inspiring :) came to know about WC categories, waiting for your new book!! I liked all of your books, blog posts, tweets, TED talk, cards. The most difficult thing is to find a publisher for a new writer, I have completed 82300 words and almost ready with the MS but unable to attract interests of the publishers ... Yes! I do understand that the publishers are looking for next CB or PS but isn't that really a tough benchmark? I love reading all your posts, but most of all I love reading about your writing journey. I keep sharing my word count with the family and basically any friend willing to listen. I share just to create a sense of accountability. There is still a long way to go. Finishing the draft, polishing it for grammar,plot coherence, pace, tone etc., then getting someone to read and agree to publish it. I once called you my pole star.Just want to let you know that you inspire me each day as I sit at my desk and type word after word after word. Wow!!! 7256 words is simply too much.... Keep going!!! Best of luck for your next book. Ankita and Nisha are an inspiration to all..!!! PS: what about the Random House Tea with you contest, who won?? What a timing! I really needed to hear all that you wrote :) Thank you. Long wait has come to an end. Thanks for sharing the guidelines to be followed while writing a book. You inspired me towards blogging. Let me start writing and look at my WC. :) Kudos! I'm sure it is hard work. A beautiful post :) Inspiring. And yes--good luck with your writing. Harimohan: Glad you found it good. Swarada: :-) Reader's high or writers high was reached previous day? I really appreciate all the hardwork and determination you put in to write and also inspire others with your posts. Your are truly an inspiration to many. Gayu:Thanks. I don't know who the winners are! Random house will announce the winners. Prats:Thank you! Since you write yourself you know what it feels like! shankari: good luck with your writing! keep at it! Frivolous analyser: i guess it is always good to set high benchmarks. For me the 'ultimate writers' are Neil Gaiman, Rushdie and Dahl. Please try Grapevine India and Mahaveer publishers too. Manasa:Thank you so very much! Seema:Thanks a lot! :) Your words are huge encouragement! Wow... I always knew writing a book was a mammoth task. Your post made for very interesting reading... like an insider's view. Keep them coming. I simply loved this post as it encouraged me to write, write and write. This is one journey of my life which I am willing to take all alone! 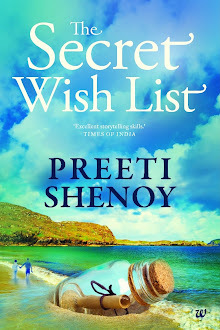 And yes count me in for knowing your WC counts as I am eagerly waiting for your next book to be out! Ya, that is way lot of words in a day. Absolutely a writers high ! U r awesome! Love, love, love this post. Goodluck with your book 4:-) n a big Thank u 4 being an inspiration in my life. u r not normal.........u r extraordinarily talented lady......so different from me.....juggling everything in a balanced way...I wish my kids had a super mom like u! How do you manage to sit and write so long, Preeti?? You are doing a real Himalayan task.. Keep going till you reach the peak. Indeed inspiring! Am aspiring to be in the Writer's world soon! You have no idea how good I am feeling right now after having read this. Dont know why but I am so inspired and full of respect for people like you who churn out so much of hard work to produce that 1 dream book. Never imagined so much effort is required to publish a book.I tried attempting to write a short story and I was completely lost in the middle. Writing needs a lot of concentration. Surely writing a book involves a great deal of effort. I liked the former one very much and suggested it to couple of my friends also, to be read...I just loved the simple language of the book very much. One incident that I often get in my thoughts is the replacement of party food order with street food and the customer accepting it whole-heartedly :-)..Funny and a practical solution !!! I am here to write something about your blog. I am still in June 2009 section of your blog, and I have enjoyed reading it so far. May be it is because of the varied topics that you write about. I particularly enjoyed the posts of your interactions with your kids/husband and was amazed at the precision of your pencil sketches. I even have plans to attend your training session on pencil sketches (if possible, when held at Bengaluru sometime in the future). On the whole, it is such a beautiful and energising blog with so much of sense, humility and the most important, reasonable and intelligent content. Keep writing on your blog...Keep writing books...Way to go lady !!! Am really pleased to have a comment from an AUTHOR on my blog. Thanks Preeti !!! Nice to have that insight into the writer's world from you. It was interesting to know that you too type your drafts. I wonder how many writers are still there who still use the classic - pen and paper. 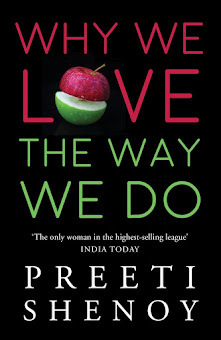 Very inspiring,Preeti.Love to read your blog. Ma'am Ur profile, blogs and this article are truly truly inspiring. Ur work shows Ur dedication and sincerity. Thanx for Ur Novels and Blog and everything. Hi preeti ... though presently my world revolves around my family comprising of my husband and two lovely sons, i aspire to be a writer someday. And for a novice like me what you shared was quite informative specially the introduction to the wc term was quite inspiring. It introduced a new aspect of writing. I read your book, 'Life is what you make it'. I loved the intense writing ... once i started the book it was unstoppable. I loved the portrayal of passionate letter writing. Once i used to write long letters to my friends and reading the book a sudden desire of writing letter gripped me. Infact i found some striking similarities between ankita's life and mine. I could so much relate to characters in the book. Hello Preeti ma'am,hope you're doing good. I had developed an attachment to the activity of reading books in my early childhood which has continued till date. Recently I came across one of your books on Amazon and saw that Life is what you make it is still on bestseller list even after four years from launch. Curiosity got the better of me and I instantly ordered it.I must say,honestly, I didn't knew about you and your books until I had seen it on Amazon under bestseller list. The book was delivered in time and being a ' kitaabi keeda'( as my friends call it) I immediately sat down to read it. Honestly, the book transported me to a different altogether. When I finished the book in a single-sitting, the post-effect was like the one we get when we come out of theaters after watching an awesome movie. And it stays fresh in your mind. Thank you ma'am for bringing such unique works to society at large. I am already planning to order all your books now.